Scottie Pippen. He’s one of the most versatile players the NBA has ever seen. He’s also the sidekick of the greatest player to ever play the game, period. Michael Jordan. Of course, we know MJ’s amazing talent led the Bulls throughout the 1990s, but would they have gotten all six championships without Scottie on the team? Most NBA scholars would have a hard time admitting Michael could have done it without Scottie by his side. Even though Pippen was named one of the greatest 50 NBA players ever, he still somehow seems a bit underrated. This is of course, due to playing alongside MJ, who often overshadowed Pip’s dynamic abilities. Just like for both players’ on-court heroics, Scottie’s shoe game also always gets overshadowed by Michael’s Air Jordan line. With the shoe lines from guys like Jordan, Penny Hardaway, Charles Barkley, Kobe Bryant and LeBron James always getting plenty of love, these ten kicks on Pip’s feet should call to attention how like his game, the man’s sneakers are a bit underrated as well. One of Scottie's most underrated shoes is the mostly-forgotten Air Swift from 1994. Scottie rocked this awesome PE color block of the shoe for the ’94 NBA Playoffs, including during his infamous vicious dunk on Patrick Ewing (look it up on YouTube). Often considered one of the coolest Nike hoops shoes of the 90’s, the Air Max Uptempo from 1996 was the first basketball shoe to have ​full-length visible Air. Scottie received a couple of PE’s of the shoe including the simple white and black version seen here, along with another similar look with red accents. Early in his career, Scottie wore AVIA sneakers but soon fell in with Nike with the help of Michael Jordan who obviously had a good relationship with the brand and could pull a few strings. After joining Nike in the late 1980s, Pippen became one of the faces of the then-new Flight line. The first great model he would wear: the Air Flight ’89. One of the earlier Flight models Scottie is associated with is the Air Maestro. Here we see him in a confrontation with John Starks in 1993 wearing a simple black and white pair. He would also go on to wear the Air Maestro 2 in a blazing all-red colorway in the 1994 NBA All-Star game where he took home MVP honors. Almost every NBA player sponsored by Nike wore the versatile Air Way Up at some point during 1996, and Scottie was no exception. Here we see him in a simple team white/red colorway, but Pip also got a similar player exclusive version with black accents. The iconic and revolutionary Air Flight Huarache was worn by a number of NBA players in 1991 and 1992, including Scottie. 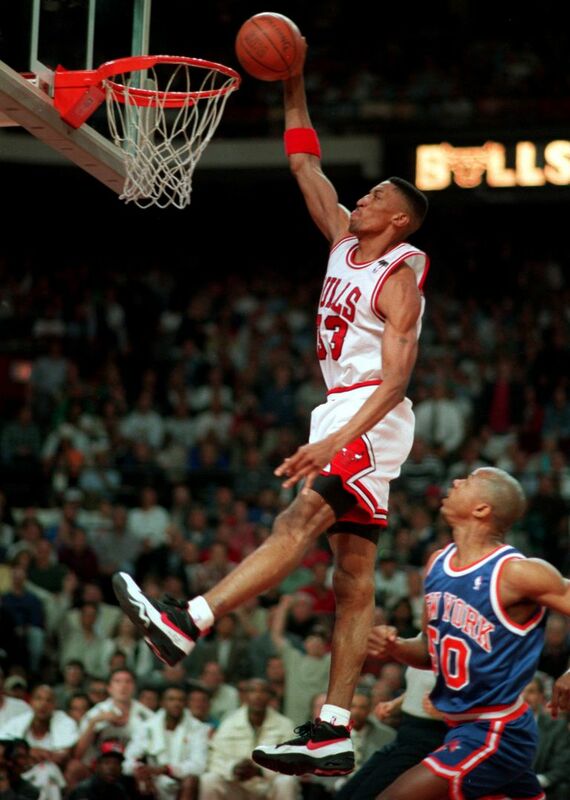 For the 1996-97 NBA season, Scottie finally got his first official signature shoe, the Air Pippen. Released at retail with a full-length Air Max sole, Scottie actually wore a modified version of the shoe with Zoom Air, the cushioning system he preferred. The awesome Air Up with its wavy design is most closely associated with a young Penny Hardaway, who received PE versions in his Orlando Magic colorways. Scottie also had a couple of great PE versions, including this black and white version with red accents. After Scottie’s modified Zoom Air Pippen 1s, Scottie’s second signature shoe got the responsive cushioning from the get-go. With a sleek design modeled after a classic car, the Pippen 2 is perhaps his all-around best shoe when considering performance and aesthetics. Even though it’s not an official signature shoe, the Nike Air More Uptempo from 1996 is perhaps the sneaker most synonymous with Scottie Pippen. The shoe’s bold design with full-length visible Air and more-than-blatant branding would have been plenty memorable on its own, but it became closely associated with Scottie after he wore them during the Bulls’ legendary 72 win season and NBA championship run in 1996. He also wore them in an even bolder color blocking during the 1996 Dream Team’s run to Olympic gold.